The Orange Book was developed by Indian Country for Indian Country. 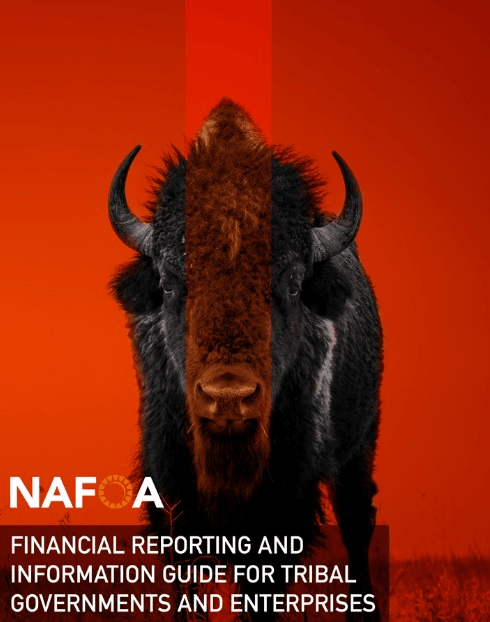 The Financial Reporting and Information Guide for Tribal Governments and Their Enterprises (Orange Book) was released on Monday, April 24, 2017 at NAFOA's 35th Annual Conference. The Orange Book benefited greatly from NAFOA's Financial Management advisory committee. The members of this group come from varied backgrounds with invaluable knowledge in tribal government finance and have an empathetic understanding of the challenges and needs of Indian Country. The advisory committee has been instrumental in cross-checking best practices, keeping current on developments and pronouncements, and sharing typical challenges tribal governments face in financial reporting. These best practices are real issues that are shared in select chapters' question and answer sections. NAFOA is pleased to also recognize the special contribution and commitment of REDW for taking a lead in writing many of the chapters in this Guide. Ms. Corrine Wilson is a past NAFOA board member who has served for a number of years instructing NAFOA’s Tribal Financial Manager Certification Program and has over 30 years of experience consulting tribal governments in accounting. Mr. Bruce Bleakman has nearly 40 years of experience in public accounting, has served as a member of the Government Expert Panel of the American Institute of Certified Public Accountants, and has contributed to several NAFOA financial reporting model guides. Nadina Paisano, CPA, Indian Pueblos Marketing, Inc.
Robert Yoder, Yoder & Langford, P.C.